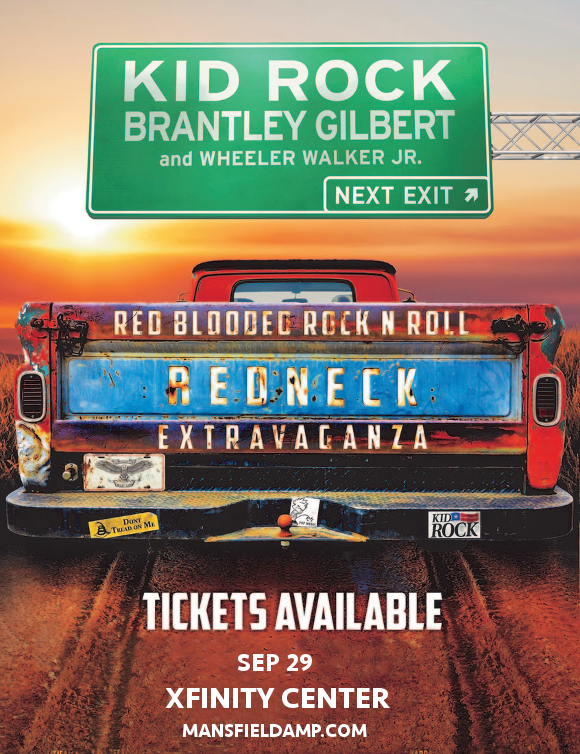 The Southern legend is back – that’s right, it’s Kid Rock, with special support from Brantley Gilbert & Wheeler Walker Jr on the Red Blooded Rock N Roll Redneck Extravaganza tour!! The multi-talented instrumentalist, singer and rapper is coming to the Xfinity Center on Saturday 29th September 2018 – so whatever you do, donʼt miss out on your chance to be there! Tickets on sale now! No service fee or shipping charge, and immediate download e-tickets available for last-minute buys!! A self-taught rapper, DJ, songwriter and producer, it’s easier to count what talents Robert James Ritchie, otherwise known as Kid Rock, DOESN’T have than does!! With his first major album “Grits Sandwiches for Breakfast” in 1990, Kid Rock showed up as an unusual force on the rap scene. In each of his albums that followed, he refined his style by blending more and more genres into his work, including country and heavy metal. A multi-instrumentalist, Kid Rock is responsible for both the music and the production on nine of his existing eleven albums. Now, Kid Rock is on tour with his latest album, “Sweet Southern Sugar,” his eleventh studio LP! The album hit number 8 on the Billboard 200 and number 4 on the Billboard Top Country albums, released to rave reviews from critics. “The 10 strong tracks have Kid Rock's signature stew of Southern rock, rap and country, layered with expletive-laden lyrics that evoke Old Glory patriotism, Don't-Step-on-Me cockiness and a celebration of redneck culture,” said the Daily Mail. Experience it all for yourself – get your Kid Rock tickets today! !